While choosing the type of garage to build is a homeowner’s dilemma, not everyone has enough space or budget for one. Still, you need a designated area to keep your car out of the weather and other elements while maintaining the aesthetics for the front of your home. Your alternatives to garages range from permanent structures that aren’t as expensive to covers that are lightweight and portable so you can store it in your car’s trunk and whip it out to use wherever you may be. A shed is going to be one of the first garage alternatives that will spring to mind for most people. You may even already have a shed of some sort on your property now. Garages are typically used for many different purposes. Some people use garages to store their vehicles, but other people use them for storage and as a place to keep their tools. If you are one of the millions of people who want to use a garage for storage, then a shed is going to work out nicely for you. A shed may not be large enough to accommodate a car, but it will be perfect for storing your lawnmower, gardening tools, and various other items. It shouldn’t be difficult at all to build a little shed and you can even buy ones that are already made. You should go with whatever is going to be the easiest solution for you. Most sheds are made out of some type of steel in the modern era. This ensures that the structure will remain sturdy and helps it to stand the test of time. Some people prefer to make sheds out of wood and these can wind up looking really beautiful, depending on how much effort was put into it. If you need a shed to store your tools, then you will be able to make it happen without too much of a hassle. Building a shed really isn’t that expensive overall. Also, it is possible to buy sheds that are already built and have them delivered to your property. Whatever route you decide to go will be fine and you will have a convenient storage solution for your tools. Storing your lawnmower safely in the shed along with other important items will give you peace of mind. A shed isn’t going to be able to provide you with all of the conveniences that a garage can. It isn’t going to be able to keep your car safe from the elements and certain larger tools may not fit in your shed quite so easily. Even so, you should be able to store many things in the shed. It might be your best bet, especially if your property isn’t all that large. If your reason for wishing that you had a garage is that your car needs to be protected, then you should know that there are options available to you. One of the most common things that people do to protect their cars is to build a carport. This is going to take a little bit of know-how on your part, but building a carport really isn’t too difficult. This is basically a spot with a little roof that you can park your car under. The carport will protect your car from getting rained on and it will keep the snow off of it if you live in a wintry area. Building the carport itself doesn’t have to be too complicated. You will want to decide whether you want it to be a freestanding carport or if it is going to be connected to your house. Either way, your car will be far more protected once it has been built. Taking care of your car the best that you can is very admirable. It will allow your car to stay looking nice and will keep it working well. A good carport will mitigate some of the damage that the elements can do to a vehicle. If you don’t have the room for a garage on your property, then a carport may be the next best thing. Building a carport should be possible as long as you have a bit of know how. You will have options for where to put the carport as well. Carports can work as freestanding structures or they can be attached to the house. It will keep your car out of the rain and snow. A carport is still going to somewhat expose your car to the elements. It isn’t always an entirely enclosed structure, so it may not provide complete protection. It is useful to have a carport and it may prevent you from having to shovel snow off of your car. Even so, it isn’t quite as desirable as a true garage. If you want to protect your car in a way that is much simpler than building a carport, then you could look into car covers. Car covers are a great way to keep your car from getting harmed by the elements. When you arrive home from work, you can simply cover your parked car with the cover. This will keep it from getting rained on and will also protect it from snow and ice. This isn’t a perfect solution, of course. You can’t cover the undercarriage of your car, so wintry environments will still impact parts of your vehicle. It is still much better than nothing at all, though. Many of the best car covers can even prevent your paint from dulling by providing UV protection. People who really care about their cars will definitely want to purchase car covers. Sometimes people even use this method in conjunction with a carport just to be on the safe side. It can keep your car from getting scuffed or otherwise damaged while it is parked. It may not be as effective as being able to park it in a garage, but it is something beneficial to consider. You can protect your car from many things if you take the time to put a car cover on it. It can keep your car out of the elements and it will prevent it from getting scuffed. These car covers can even protect your car from UV rays, keeping the paint job nice for a longer period of time. If you use one of these car covers regularly, then your car is going to stay in nice shape, barring some sort of unusual accident or circumstances. A car cover is only going to be able to do so much for you. It can keep your car safe from certain things, but it cannot protect it completely. There are going to be aspects of the environment that will still impact your car even when you are using a car cover. This doesn’t mean that it isn’t worth buying a car cover, but you should go into your purchase with realistic expectations. An awning is going to be able to keep your car from getting rained on and from having snowfall on top of it. It really works very similarly to the carport that is mentioned above. The difference between a carport and an awning is that an awning is generally going to be attached to the house. It is a part of a house that extends outwards to provide shade and protection. Most people who have awnings on their home will have them placed over the top of a patio area or a deck. It isn’t really as typical to see an awning placed over the driveway. This doesn’t mean that you can’t make use of this method, it just means that it may not be as common. If you want to build an awning and your driveway comes up close enough to your home to make this a practical option, then it is something to consider. You should be able to build an awning or you can buy one and have it installed where you need it. The awning being shown here is an easy one to install by yourself if you are somewhat handy. You may need to purchase two of them and use them in conjunction to make a long enough area for your car. 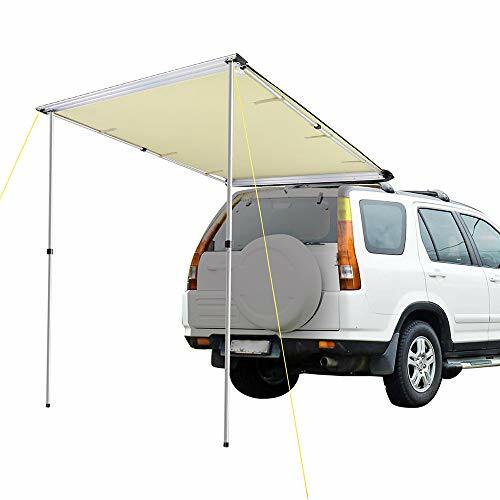 This awning is just under seven-feet long, so two of them will help to create a good parking area for your vehicle. Whether or not this is a cost-effective enough method is up to you to decide. Installing an awning such as this shouldn’t be too difficult for you to accomplish. You’ll be able to get everything put up in a reasonable amount of time and you will be able to start parking your car in a safer way. You won’t have to be as concerned about rain and snow when you have an awning to park underneath. It is possible to buy retractable awnings, as well, if you are in need of that. This is not going to be quite as convenient as some of the other options. If you are going to spend this kind of money to help protect your car, then you would be better off having a carport installed in your home. An awning is a possible solution and it can work for what you are trying to do. It just might not be the most convenient way to make it happen. Telescoping tents are actually going to act pretty much the same as the awning mentioned above. The difference is that this is a portable version of it that is somewhat easier to use. When you need to cover your car up, you can use the telescoping tent to help keep it safe. It won’t take too long to set the tent up and you will be able to rely on it in a pinch. People even take these telescoping tents out with them when they are traveling. It is an easy way to protect your car when a heavy rain suddenly appears. You’ll be able to take quick action and you can ensure that your car stays in the best shape possible. It is easy to set up this telescoping tent quickly. If you want to avoid spending too much money, then this is a good option. You can purchase one of these tents at a reasonable price and you will be able to make use of it right away. This is not going to provide as much protection as a true garage or a carport. If you want to have a simple solution that you can make use of without having to spend much money, then this is a good idea. Just don’t expect it to be able to match up to a real garage in terms of protection.